NEW YORK -- Mike D'Antoni had searched for an answer at backup point guard all season, and Monday night against the Nets, it looked like he found one in Baron Davis, who made his season debut. Even though the Knicks lost 100-92 to the Nets, Davis showed promise with his ability to get into the paint off the pick-and-roll. Davis played 10 minutes as a sub (a number that should float around 15 to 20 consistently), scoring on a 3-pointer and collecting an assist on a Steve Novak three in the second quarter. Baron Davis posted three points and as assist in 10 minutes. More important, starting point guard Jeremy Lin played 36 minutes instead of more than 40, his usual routine. Davis' return marks an important strategy for the Knicks moving forward, and that's best represented in an overlooked stat the top point guards in the league have in common. The Bulls' Derrick Rose, Clippers' Chris Paul and Thunder's Russell Westbrook play around 35 minutes per game. Their backups, C.J. Watson, Mo Williams and Reggie Jackson, respectively, add value off the bench -- so the need to rush Rose, Paul and Westbrook back into the game isn't necessarily there. That balance is important, but even more important during this shortened season, which features endless back-to-backs and four-games-in-seven-night weeks. Coaches know they can't wear down their starting point guards, the most critical position in the league to build offensive structure, fluidity and chemistry. Lin has done that since becoming the Knicks' starting point guard on Feb. 6 against the Jazz, but he's been playing more than 40 minutes per game. He's already had three outings near 45 minutes. 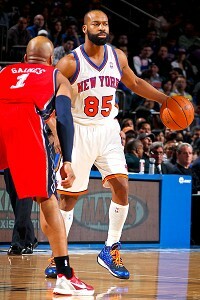 That can't continue; the Knicks' schedule just reached its halfway point Monday night with a 100-92 loss to the Nets. The Knicks are now 16-17. D'Antoni had rotated the backup duties from Toney Douglas (inefficient) to Mike Bibby (day-to-day injuries) to Iman Shumpert, but Shumpert's been better suited at off guard. Case in point: At the start of the second quarter against the Hornets on Friday, the rookie turned the ball over once and he couldn't generate enough ball movement in the offense, which missed three straight shots. The Hornets quickly erased their deficit, and D'Antoni wasted no time inserting Lin back into the game. But when D'Antoni plays Shumpert alongside Lin, the rookie is able to score in transition, and with his shooting and penetration. Therefore, his sidekick ways leave a gaping hole at the backup point guard position. That's where Davis steps in with his assists. He almost had his first dime Monday night when, in the final seconds of the first quarter, he weaved through the lane, then put the ball behind his back and swung a no-look, one-hand pass to Novak, who swished a 3 from the baseline corner. However, it was waved off because it came after the buzzer. As the sequence was unfolding, it got Amare Stoudemire off his seat while he was on the bench, and he started celebrating with his teammates. In the postgame locker room, STAT talked about not only the flair Davis adds to the team, but his passing ability. "He plays with excitement," he said. "He's a phenomenal point guard where he moves the ball well. He's very crafty. And once he gets going, it's tough for teams to defend us. So we're going to see that from him. I was very excited when he went behind the back and threw that no-look pass to the corner. So we're looking forward to that." There were a few other times Davis was able to draw the defense in with his drives and then kick out, but the Knicks just couldn't hit the long ball tonight. They finished 5-for-21 (23.8 percent) from downtown in the game. Backup shooting guard J.R. Smith was one of the brickers (0-for-5 from three), but in his defense, it was only his second game with the Knicks, with no practices under his belt. Looking ahead, Smith is excited to play with Davis, a former Hornets teammate during his rookie season in 2004-05, because he knows more looks will open up for him on the court. "I love Baron's game, ever since my rookie year in New Orleans," said Smith, who was wearing bright orange Nike Hyperdunk sneakers during the game. "The way he passes. He's a pass-first point guard for sure. He wants to push the ball up and down the court. He plays defense and, the most important thing, is he plays with heart, and that's what you really need out of your point guard. He's very vocal and he's a leader. Once he really gets 100 percent and gets his feet up under him ... It's going to take time for him as well." Once that time comes for Davis, the Knicks will have a huge boost from their bench that will enable D'Antoni to breathe easier when he rests Lin. But at the same time, D'Antoni didn't dismiss the possibility of Davis starting at some point. "Nothing's ever written in stone," D'Antoni said before the Nets game, "but Jeremy's playing pretty well." Either way, it's a better problem for a coach to have competition at point than have it be a one-sided situation. With Davis back, it doesn't appear that way anymore.